Goldfish have always been a recommended pet for both first-time owners and children because: 1) They're plentiful and inexpensive 2) You can win them in the ring toss game at the local fair or carnival and 3) They're very easy to care for. Which reason is not totally true? Well, if you guessed number 3, you're correct! First Off - Get Rid of The Small Fishbowl! The first item on your agenda should be to get rid of that dreaded small goldfish bowl. A goldfish bowl may be fine for animated goldfish in cartoons, but for the real life goldfish, the bowl is a death sentence! What you need is at least a 10-gallon tank that will meet your goldies' specific requirements. Did you know that a goldfish's exterior body stops growing when kept in a small area? However, even though the body of the fish will stop growing, its internal organs will keep expanding in size. The spine, fins and eyes will also continue growing and, eventually, this will cause the fish to die as its interiors are squished together and the spine bends into an S-shape. This makes for one very unhappy goldfish. Always keep in mind that those "tiny" goldfish you've won at the fair has the potential of growing into a rather large 15 in. (14cm) or larger fish! 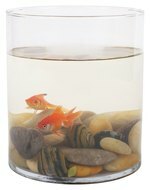 Goldfish, it may surprise you, not only need a lot of space to grow, but it's ideal for them to have lots of company. They are a very social fish that love interacting with other goldfish. This is another reason why keeping a single goldfish in a small bowl is never a good idea. Make your fish happy with a filtered aquarium basically because of the amount of waste they produce due to their mostly vegetarian diet. Without a filter, your goldfish could die of ammonia poisoning. You can see the signs if the water turns cloudy and you notice their skin turning blackish because their gills, fins and skin are being burned by the ammonia they excrete! This, unsurprisingly, eventually leads to death. Even, in some cases, double filtration is recommended. Remember, your fish will become very unhappy with nitrate spikes and ammonia poisoning, so buy that filter suited for your specific tank. The lack of surface area in a small bowl can lead to de-oxygenation and your goldfish dying from suffocation. To combat this, you may want to install a pump in your aquarium. If your fish frequently comes up to the surface of the water, you may think he's begging for more food, when in reality your fish is gasping for air. Some recommend an 'air stone' which sometimes doesn't create enough surface movement for the dissolving of new oxygen in the water. This is why a larger tank is important—more surface area! If you still notice your goldfish gasping, install an air stone and if they still gulp, get a pump! If the problem persists, check what you're feeding your fish. Fish flakes can cause bladder problems, but a good quality pellet food may be better and nutritious for goldy. Unstable water temperature may also make your goldfish unhappy. Even small changes in temperature can stress your goldfish and bring on immune system problems which will make your fish more susceptible to parasites and diseases. 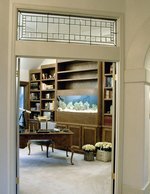 • Your goldfish should be swimming constantly and not floating, bobbing or sinking. • They should eat regularly and eliminate their waste frequently. Provide some variety in your fish's diet. Pellets everyday can become boring. Try feeding your goldfish treats like peas, spinach, shrimp or Daphnia. • The appearance of your goldfish should be shiny. Dull areas on the scales is not a good thing and the same goes for dull looking eyes! A stressed fish needs attention! • Relationships between tank mates must be closely observed. Don't allow your goldfish to become a victim of other more aggressive fish. You may notice tears in the fin or bite marks. Goldfish, unlike other fish, are best kept in goldfish only tanks rather than in a tank of, lets say, mixed tropicals. A fish less stressed is a definite happy fish! • Your goldfish is very social so get your goldfish some friends (while avoiding overcrowding of course.) Fish company will make your goldfish happy! • Goldfish do not have eyelids so you'll make your goldfish happy by not turning the aquarium lights on and off! Try using a dimmer (yes, sorry, something else to buy.) Goldfish also hate loud noises so try not banging or tapping on the tank. A fish less stressed is a definite happy fish! The Goldfish Tank: Are Your Goldfish Happy?